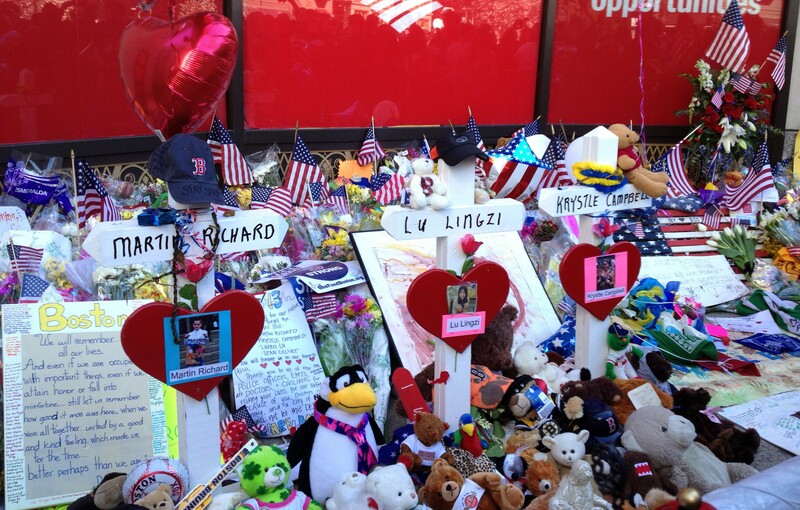 Memorial for the victims of the Boston Marathon bombing: Martin Richard, Lingzi Lu, Krystle Campbell, and Sean Collier. Apparently a lot of people felt that way, because there were a million people along the 26.2 miles of the 2014 Boston Marathon, there in tribute to the four people killed, and the 260 people who were badly injured. The Richard family lost the most: their son Martin, aged 8, died; his younger sister Jane lost her leg, both parents were wounded, and his older brother Henry, though not injured physically, witnessed all the devastation and loss. There were a lot of t-shirts in blue and yellow that said, “Boston Strong,” and even some with a quote from Mr. Rogers, a beloved minister who had a children’s program on PBS. The quote said: “When I was a boy and I would see scary things in the news, my mother would say to me, ‘Look for the helpers. You will always find people who are helping. 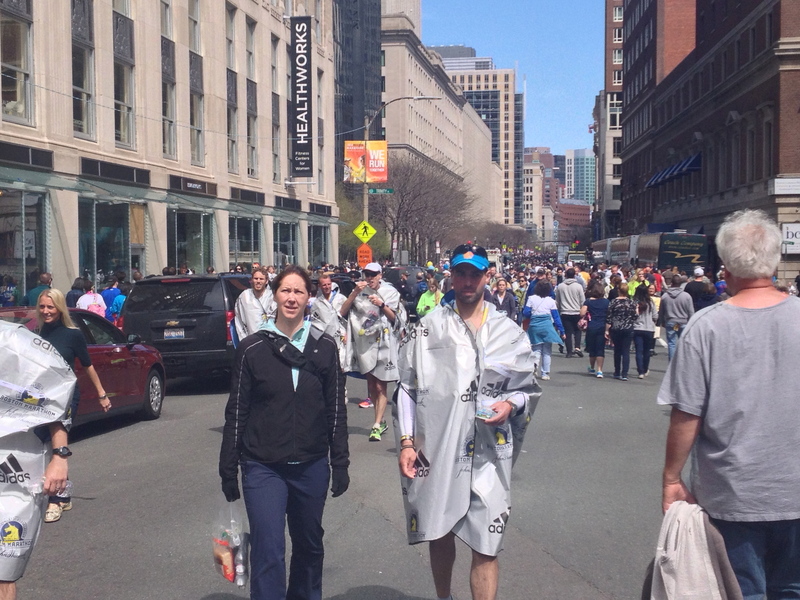 '” And at last year’s Boston Marathon, there were a lot of people helping after the bombs went off. 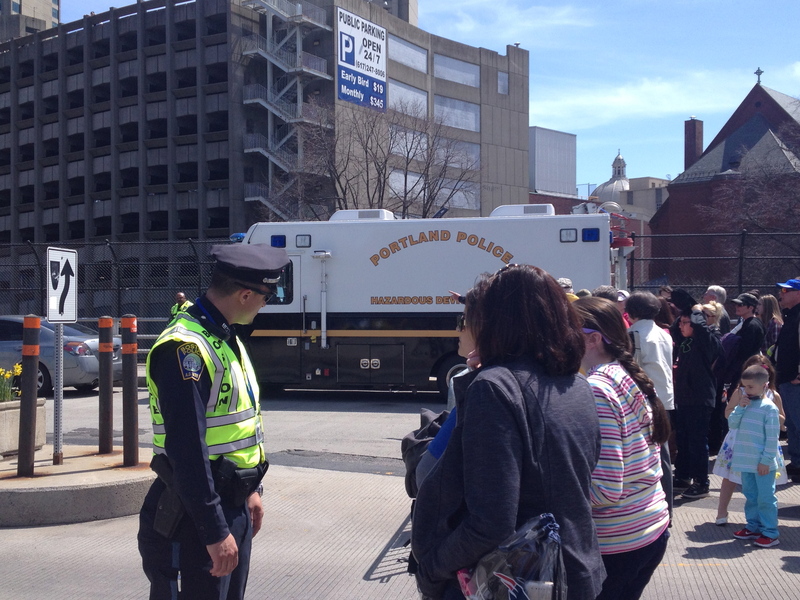 Security for the 2014 Boston Marathon, two miles from the Finish Line. 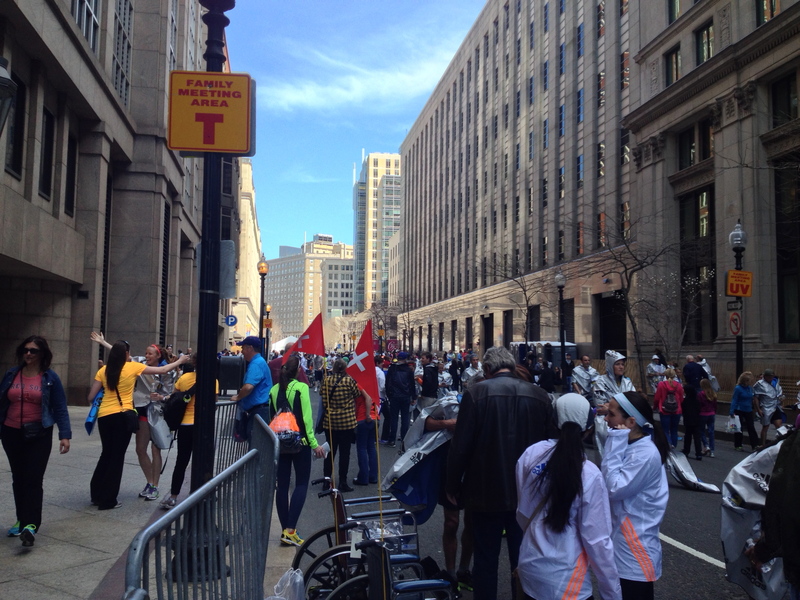 But despite first impressions, things at mile 24 were not as tight as we feared; we were able to walk up to the barricades without being “wanded,” which was being done on Boylston Street near the finish line. People had been told not to bring any backpacks, and I didn’t see a single one. 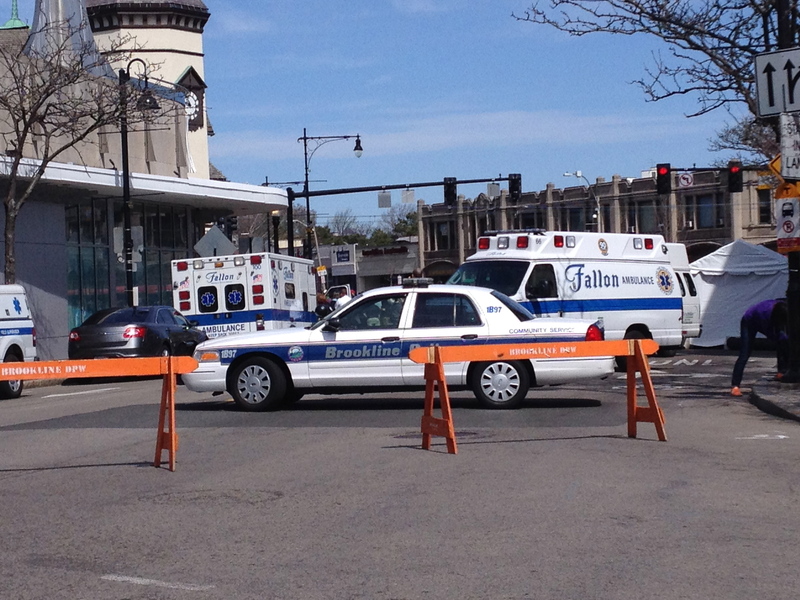 New barricades had been positioned at the far side of Beacon Street, where last year there had been none. But I have to say that they were not forbidding; they were almost decorative and it would have been easy to slip through them if necessary. 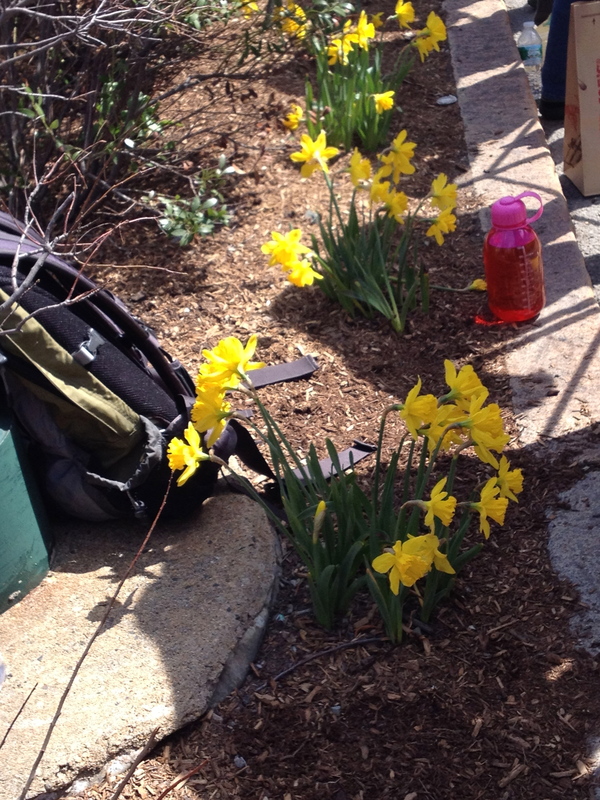 The towns all along the route have planted daffodils, one of the official colors of the Marathon, and they were a lovely sight. The wheelchair runners were first, followed by the women’s frontrunners, and then the men’s frontrunners. In all, there were 36,000 runners, 9,000 more than last year, in order to give additional people the chance to run and finish the race, in case they had not able to complete the course last year. 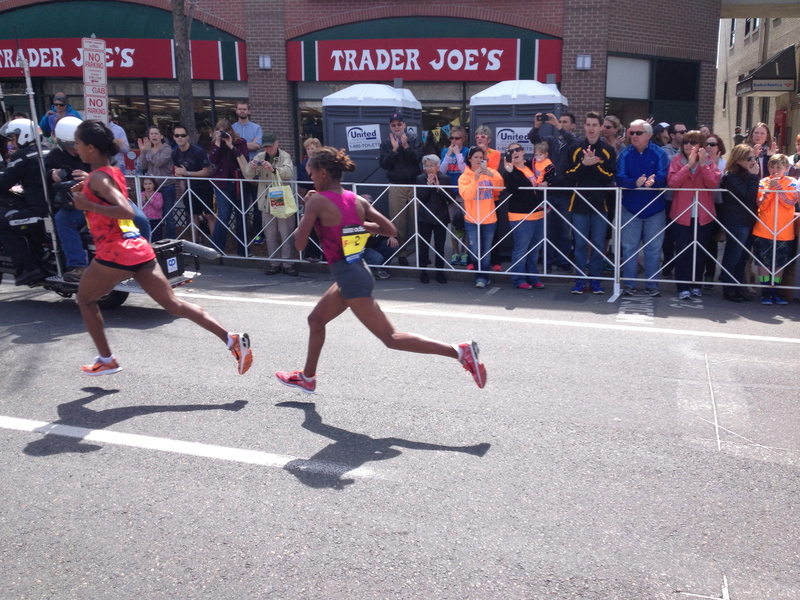 The women’s frontrunners at mile 24, going so fast I could barely photograph them! I decided to go to the finish line to see where the race ended, and the bombs had gone off last year. 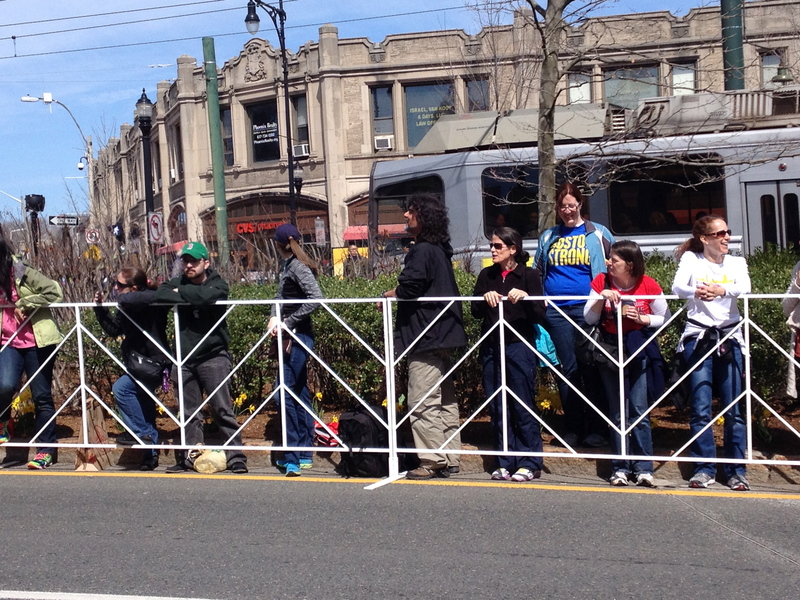 Luckily, the “T” ran along Beacon Street for part of the way, so I could view the race from my seat. The first thing I saw when I came aboveground from the T was this truck sporting the word “Hazardous” which probably had something to do with biohazards that they were checking for last night. 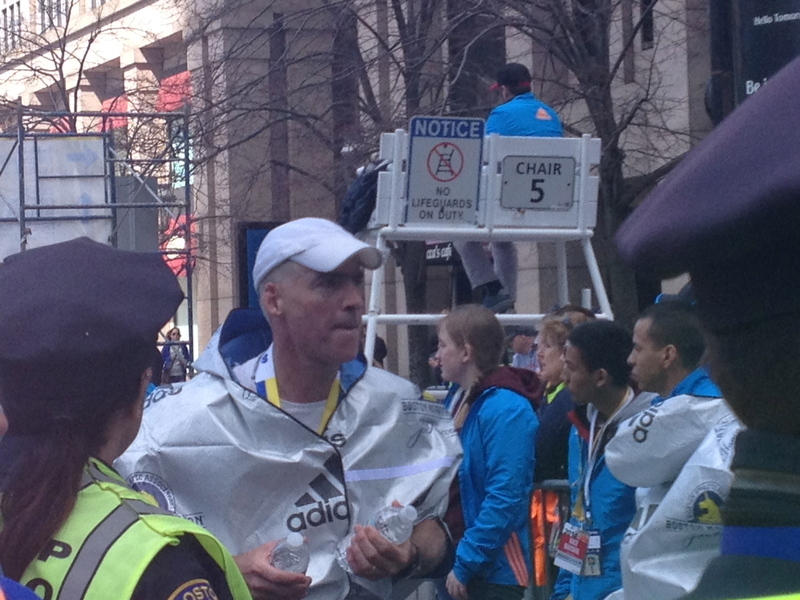 The streets near the finish line were barricaded off and you needed a special pass just to get near the runners. Half a block from the FInish Line. 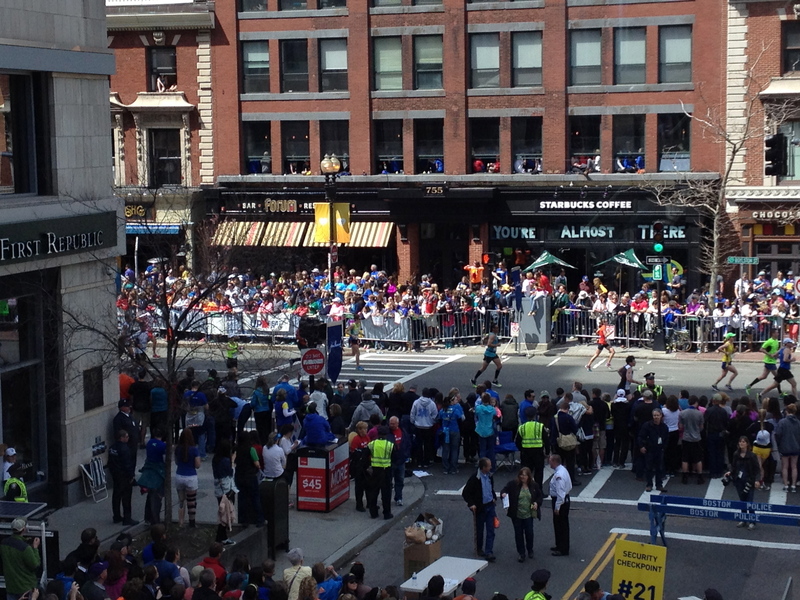 I wasn’t able to see any of the runners from my position in a large crowd behind the security barricades, so I had the brainwave of going into Lord and Taylor’s, which has huge windows overlooking the race. View from Lord and Taylor. At the left, the Forum Restaurant, where the second bomb went off. Later, as I went toward the Public Garden and a T station that was open (the two closest to the finish line were closed for the day), I saw floods of runners who had just finished the race, wearing silver capes. When they had finished the race, the runners were guided towards the open space provided by the Public Garden, the start of Boston’s “Emerald Necklace,” and a beautiful, peaceful place. 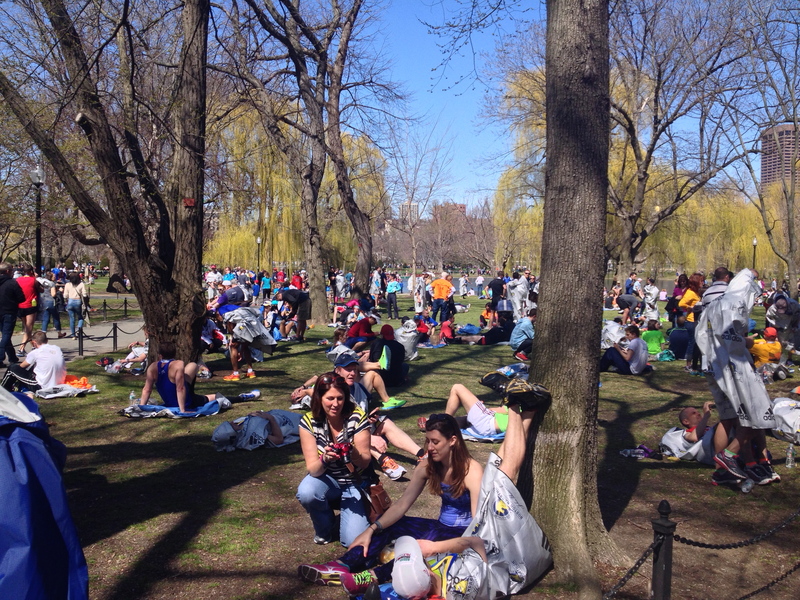 Runners and their families and friends in the Public Garden, post-race. 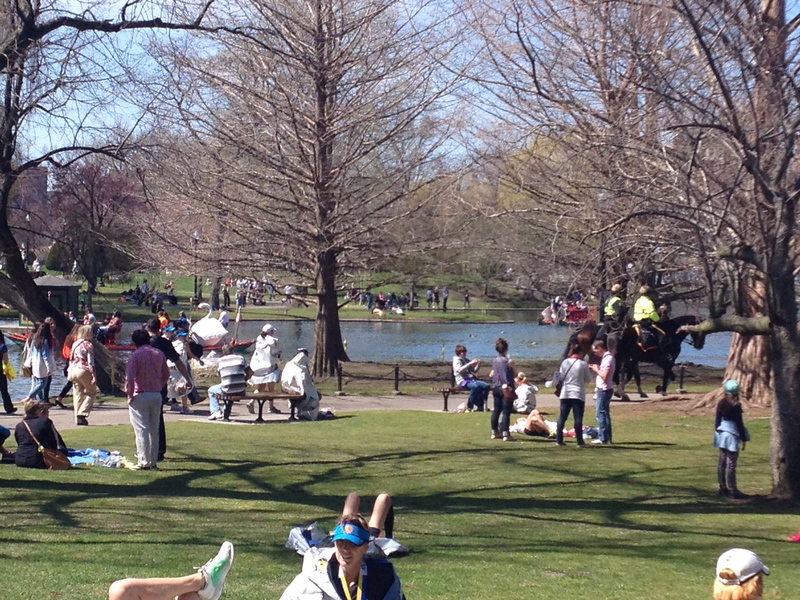 Public Garden: horses to the right; swan boat to the left. 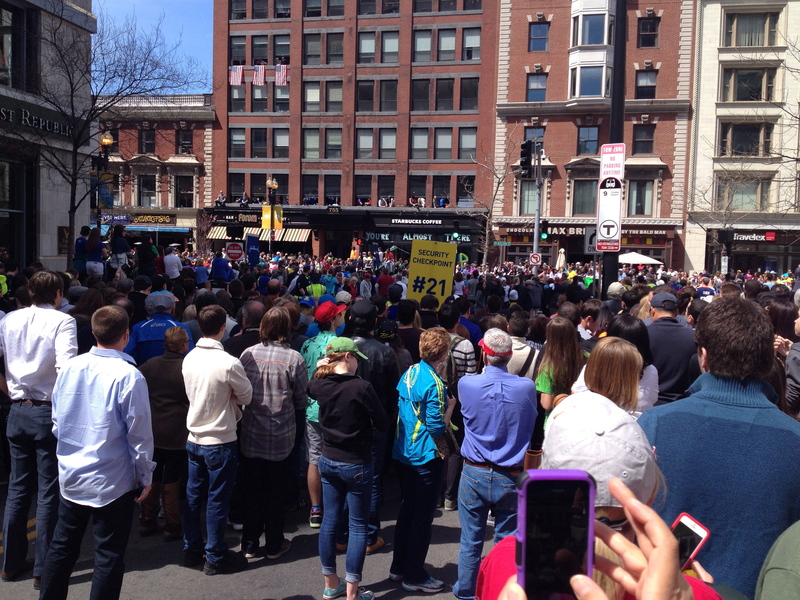 The 2014 Boston Marathon was a hard day, particularly for those who had lost loved ones or been injured themselves, but it was a great step towards paying tribute to those who suffered so grievously, and taking back the race for ourselves–the runners and the people of Boston to whom it rightly belongs.